For over two decades The Systems Group, Inc. has provided industry worldwide with a variety of products including custom forms, custom labels, stock labels and thermal transfer ribbons – all of which are manufactured with the latest advancements in graphic and converting technology and equipment. Our wide range of services, commitment to rapid real-time response to client needs, resourcefulness in helping clients craft creative solutions to their problems – big and small – and client-centered culture of total customer satisfaction has helped us build an enthusiastically loyal clientele. For clients that aren’t sure exactly what they need with their custom label and forms, we love to help them solve their problems. Just tell us what you want to achieve and we will work with you to reverse-design and create the best looking and most effective image at an extremely competitive cost. For those that run out of custom forms or labels and need them fast, we invite you to put our people pleasin’ priority processing to the test! You’re as important to us as your immediate product needs are to you. If you’re simply having problems, or not satisfied with your current printing vendor, we want you to know we don’t believe in customer “satisfaction”, but in customer “elation.” Let our resourcefulness and responsiveness “WOW” you as we help you “wow” your customers. 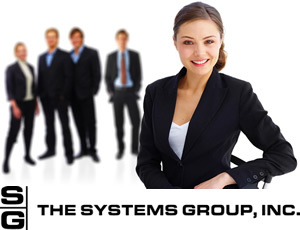 You’re always welcome to experience The Systems Group difference. Your calls will come directly to our Customer Service Department where our well qualified professionals are and ready to assist you in all areas of Custom Labels, Custom Forms, Stock Labels, Stock Imprinted Labels and Thermal Transfer Ribbons. For your convenience, our “Stock Label Division” inventories over 180 items including SHEETED LASER LABELS & CARDS, THERMAL TRANSFER LABELS & RIBBONS, AND DIRECT THERMAL LABELS. How versatile are our products? Our sheeted label stock comes in either ultra-lite weight for table top-laser printers or medium weight for high-speed laser printers. Our thermal transfer stock can be purchased with or without ribbons included and both are engineered for use in the most popular printers. In continuous stock labels, we supply a variety of items not found elsewhere. Any of our continuous stock label items can be imprinted (up to four colors), perforated, or slit, with pricing available from our customer service department. Stock label imprint orders normally ship within 5-10 days. Our extensive line of stock labels can be shipped via UPS Ground ship the Same Day if placed by 12:00pm PST. We would love to hear from you and are confident you’ll be thrilled with our quality, service and pricing. Send us a “quick quote” request online, email us or better yet call us today at 800-331-9595 to find out how we can help you grow your business in unexpected ways.